Showing 1–10 of 1,461 items. 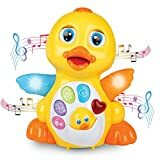 STIMULATE BABY'S GROWTH: The best fun your baby can have is through learning and growing - the musical duck will keep your child happy through his or her early development stages! 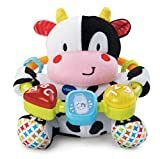 MANY MODES FOR LOTS OF FUN: With six different buttons located on its chest that play melodies, activated voices, and flash lights, every day is going to be a new adventure for your toddler! 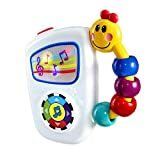 PLAYS FUN MUSIC: So many different songs come out from this duck, your baby's auditory senses will develop quickly and healthily - music teaches your child about rhythm and animal sounds. VIBRANT COLORS: From the duck's eyes, to its wings and body, it is highly visually stimulating showing your baby a bunch of colors and lights - your toddler will learn about colors and have fun! CUTE MOVEMENTS: Your little one will love chasing the duck as it glides across the floor and flaps its wings. 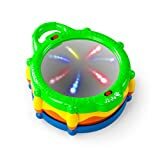 This fun toy makes a great holiday gift or birthday present for both boys and girls. 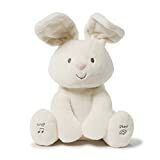 A toy that will be enjoyed long after the Easter Basket is put away! 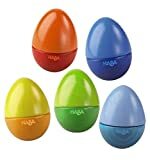 Each egg makes a different sound. Three eggs rattle, one jingles and one twitters. Little sound explorers discover the world around them and make music and tunes. They develop a feel for rhythm and train their speech in a playful manner. 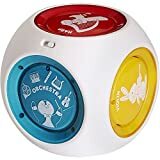 This toy encourages color & shape recognition as well as auditory learning and sound differentiation. Dance to the beat of baby's drum! 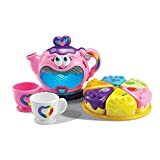 Help baby learn with the power of play!